I found this picture on the Museum of the City of New York website. 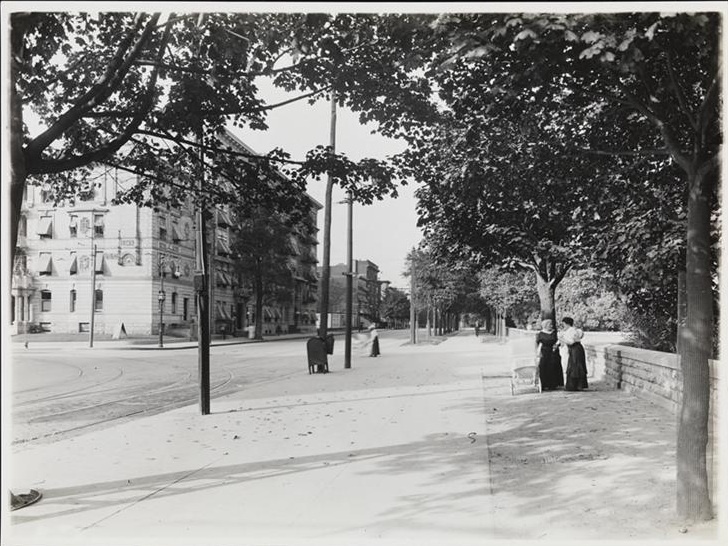 It’s a 1915 shot of Ninth Street and Prospect Park West. Note the trolley tracks that turn onto PPW from Ninth Street and the absence of parked cars. You can also see what appear to be two strollers in the picture, including one being pushed across the street. That’s probably the only thing that hasn’t changed on Prospect Park West in the past ninety-five years. See my previous entry on why cries of aesthetic desecration are a selective viewing of history. Also note the second, curb-side row of trees on the sidewalk. Those are no longer there. Good eye! Imagine how nice it would have been to walk under that kind of canopy. Indeed. You will also note that PPW’s roadbed was substantially narrower back then and the sidewalks were wider. It looks like the recent redesign actually restored PPW’s roadbed to its historic width.